Friday, June 20, the 221st General Assembly of the US Presbyterian Church voted 310 to 303 to withdraw its $21 million holdings from three major US corporations that profit from Israel’s military occupation of Palestine: Caterpillar (heavy equipment to destroy homes and build prisons), Hewlett-Packard and Motorola Solutions (surveillance technology to control the Palestinian population). 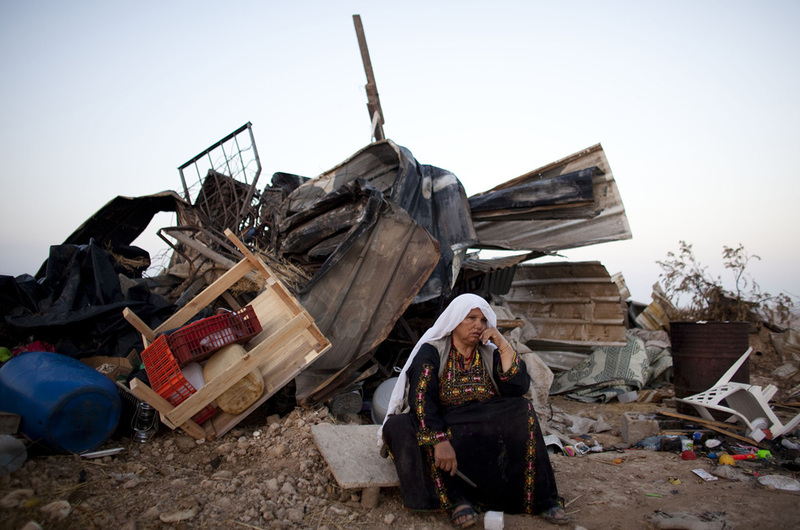 Al-Arakib village, demolished by Israel 63 times since 2010. The historic vote followed a decade of intense study, debate and soul-searching throughout the church. Major US Jewish organizations that claim to represent all Jews, and their conservative Christian allies, lobbied aggressively to derail the initiative. As usual, their weapon of choice is to label supporters of boycott, divestment and sanctions as anti-semitic. Two years ago it worked, resulting in a divestment vote that fell short by a similarly narrow margin. To counter this deluge of propaganda, the American grassroots organization Jewish Voice for Peace brought to the Assembly a panorama of supportive voices from Jews of conscience across the United States. the Central Atlantic Conference of the United Church of Christ voted to divest from companies that profit from the occupation. the pension fund of the United Methodist Church divested from G4S, a British-Danish transnational security corporation operating in Israeli prisons to detain and abuse thousands of Palestinians. the Bill & Melinda Gates Foundation also divested its entire $184 million holdings in G4S. More detail on the international BDS movement in Our Way to Fight. Thanks again for the post Michael. After you posted the hard-hitting and ironic video of Mekorot’s involvement in the water industry I emailed Ove Arup (a giant engineering and consultancy corporate) to lobby against their possible involvement in infrastructure development in partnership with Mekorot. I gave them the link to the video. They replied to say that their actions at that stage were entirely exploratory. I have forwarded this post most recent post to their media department from where I received their email reply to my earlier communication. Any further pointers to background on this matter (infrastructure development projects) where companies have walked away or investors have pulled back would be very helpful. Thanks Michael, Some good news at last! It’s heartening to see the Bill and Melissa Gates Foundation divesting.